OTHER THAN A FEW WE HAVE THE EDITION IS SOLD OUT. Free Delivery. Etching House carrys a range of Original Etchings and Pencil Drawings by Norman Lindsay. The Audience Size 25.2×17.7cm Norman Lindsay’s use of aquatint in the original etching The Audience reveals moonlight more subtly than would be possible in any other medium. 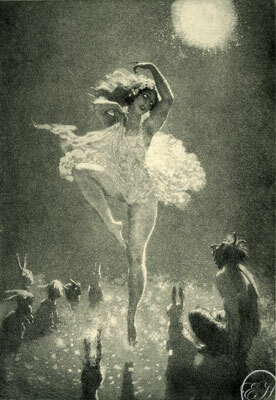 The dramatic effect of filtered moonlight in, The Audience by Norman Lindsay is enhanced by the use of aquatint. Other etchings featuring moonlight and the use of aquatint are Moonlight’s Piper, Moonstruck and From the Moon. Howard Hinter was a keen buyer of Norman’s etchings and purchased two copies of The Audience. In a letter to Norman, Hinton told him that he wanted them ‘to cheer me up after the long day’s work in town’. Etching House has stock The Audience by Norman Lindsay will be available for delivery from the 29th of March 2007 also being launched is Light Lyrics and the Book titled Portrait of Pa. Etching House delivers free with in Australia for unframed Etchings or Facsimile Etchings Books of Norman Lindsay. Etching House specializes in limited edition etchings, prints, works on paper.